How to Fail Better: March 25, 2018 – Rev. Canon Dr. William J. Danaher Jr.
Last week, I talked a bit about my study of ritual, and why I find rituals important. My interest is not just in sacred rituals like the Eucharist, but the rituals we employ in everyday life. The way in which we introduce ourselves to one another, for example, is a ritual performance of our identity– a way of revealing to others who we are. The ritual of shaking hands, or choosing not to, says a lot about who we are, whether we know it or not, whether the message is missed or received. As I was reflecting on my sermon for today, I found myself thinking about ritual again. However, instead of thinking about rituals of introduction, I was thinking about the experience of ritual failure. This happens when something causes a ritual to collapse. Just like shaking hands, ritual failures happen every day, and they reveal a lot about who we are. For example, when you stick out your right hand to shake hands, and someone instead, at the same moment, opens up their arms for a hug. That’s a moment of ritual failure. You’ve mistaken what was going on. You thought you were in a formal moment, but it was actually an intimate moment. Rituals are often shot through with anxiety because we fear ritual failure. We don’t want to be mistaken. We want our rituals to matter. When a bride or groom try to say the right words at the right moment in a wedding service, such moments are fraught with tension. At the same time, rituals failures can also lead to moments of grace. In 1991, while visiting the United States, Queen Elizabeth toured a housing project in Ward 7, the poorest neighborhood in Washington D.C. This is a common ritual practice by the royals, and it was meant to lift up the country as a whole – including its rich and poor – before the eyes of the world. A woman named Alice Frazier welcomed the Queen into her home. No one had told Mrs. Frazier that the proper protocol was that no one should physically touch the Queen. So, Mrs. Frazier did what came naturally – she reached out and hugged the Queen. This moment of ritual failure created a ritual crisis that the Queen negotiated by smiling and hugging Mrs. Frazier back. Known worldwide in the media as “The Hug,” the exchange between Mrs. Frazier and the Queen came to symbolize a deeper connection between two women. Community organizers, looking back at that moment, credit it with playing a catalytic role in the neighborhood’s revitalization. As soon as these words tumbled out of my mouth I realized that I had inadvertently fallen into the ritual I follow when I talk to my wife, Claire. We always finish every phone conversation by saying “I love you.” Even when the phone call is just to give me a shopping list, Claire and I finish our conversations this way. However, having said the same words to Pastor Manisha, I became terrified. For a moment, I was speechless and the silence across the phone line was as subtle as shattering glass. And then Pastor Manisha said, “Well, of course, I love you, too, with agape love.” And so, another connection was established. The moment of ritual failure set in motion a ritual crisis, which became – thankfully – a moment of grace. Ritual failures say a lot about us. They reveal the kind of desire for spiritual connection that we seek inside our rituals. We want our rituals to have meaning. We want them to be transformative. We want them to achieve what they’re supposed to achieve. Palm Sunday and the Passion story is one such ritual. It’s this incredible moment in which we trace a moment of ritual failure and the ritual crisis that happened afterward. This ritual failure is embedded in the memory of the church. We celebrate the time in which Jesus enters Jerusalem and people are waving palm fronds – a ritual of royal visitation. Not a week later, that whole ritual self-destructs. The same people are chanting, “Crucify him.” Jesus is betrayed and judged, condemned and crucified. Most often, when people write about ritual failure, they blame the worshippers, who have gotten the ritual wrong. And this is certainly true in the church’s memory of Palm Sunday and the Passion. We remember that we have a part of ourselves that will worship Jesus and, at the same time, will deny and betray him if given half a chance. At the same time, we can also learn a lot in these moments about our desire for spiritual connection. We also learn a lot about our need for grace. A few years ago, in 2014, I travelled to Israel and I went to the Church of the Holy Sepulchre in Jerusalem, the physical site where Jesus was, according to memory, crucified. In the middle of the church, there is a piece of the rock of Golgotha on which the cross of Christ is believed to have stood. And, just a few feet away, there is the place where people believe that Jesus was buried. The Emperor Constantine built the Church of the Holy Sepulchre in the 320s. He directed his builders to carve away the stone around these sacred sites, leaving only that part where the cross supposedly stood. His workers also carved away the cave around which the tomb of Jesus supposedly was located, and a little chapel was constructed around it. During the Crusades, knights believed that unless they went and touched these holy places, they would not complete their pilgrimage to Jerusalem. They would not be forgiven their sins. Like many other such pilgrims who have traveled there over the centuries, I went into the Church of the Holy Sepulchre with the hope that I would also somehow experience there some kind of transformation. But I discovered that the church was full of tourists who appeared to be completely uninterested in experiencing a holy place. It was also over 100 degrees inside and freakishly hot. Everyone was bumping into each other, jostling each other, trying to get each other out of the way, so that they would not be denied their opportunity to touch every relic available. My little group made its way through the crowd until we came to another site that was constructed in the 13th century. It’s called the Anointing Stone, and it’s a beautiful stone pallet made of dark marble on which it is said, according to legend, that Jesus’ body was anointed with spices before he was placed in the tomb. And it was at that moment that I experienced ritual failure. I realized that the ritual I was observing was not prayer, but a ritual of tourism – of taking pictures of yourself in unfamiliar places. Plus, there is nothing in this world that is more inhibiting to the practice of prayer than being told to look more prayerful. Nothing else can freeze you up more and keep you from praying. It’s a little bit like when people sometimes say to me, “You’re funny. Say something funny.” At such moments, my sense of humor leaves my body like a ghostly mist, and I turn to stone. However, I learned something powerful during that moment of ritual failure and crisis. As I was reflecting later that night in my hotel room, I realized that the mystery of Christianity is not a mystery that I have to travel back in time to realize. I did not need to recreate my relationship with Jesus through an exercise in historical reenactment. Rather, the mystery of Christianity – the joy and power of saying and confessing that Jesus is Lord – that mystery is always available to me. Because the mystery of Palm Sunday and the Passion isn’t a journey I have to take. It’s a celebration and remembrance of the journey that God in Christ has taken to you and me. The mystery of Christianity is that Jesus would come into this world to die for us so that we might no longer experience death, so that we might know his love and his grace and his forgiveness. And the mystery that is revealed in all of our own ritual failures is that Jesus keeps coming. This truth is evident not only in the responses of the crowd to Jesus, but in the whole fabric of our Passion today from the Gospel of Mark. Pilate experiences ritual failure when Jesus is condemned and Barabbas, a murderer, is freed. An innocent man is therefore sentenced to death and executed. The ritual practice of Justice fails. Later, when he is hanging on the cross, Jesus tries to recite Psalm 22 as part of a ritual of lamentation. “My God, my God, why have you forsaken me?” Jesus asks. However, he can only say the first part of the psalm before he dies, and his prayer goes unfinished. This is another moment of ritual failure, and, in this moment, Jesus shares our human experience completely. He knows what it is like to have a prayer go wrong and, apparently, unanswered. In the midst of all of these ritual failures, however, God in Christ is still coming towards us. These ritual failures are built into the text, I think, to remind us that Christ’s forgiveness for us is infinite. It’s we who become tired of asking for forgiveness. Christ’s love for us is everlasting. There is no height and no depth; there is no breadth that can measure the infinity of God’s love for us in Christ. It’s we who get tired of living in that love. Most importantly, the reason why we have all of these ritual failures is to remind us that there is no way for us to recreate, by our own devices, the love of God in our lives. It is only through accepting the grace and peace that has already been shown to us through a God who is willing to have his face spit at and nails driven through his wrists for you and for me. The art that seems to sum up what I have to say today is by Anselm Kiefer. It is a sculpture called Palmsonntag, which is German for “Palm Sunday” [See Below]. Kiefer decided to be an artist after a moment of ritual failure. In an interview that he gave a few years ago, he said that, as a young man, he was raised Roman Catholic and incredibly religious. He thought he might be called to the priesthood. At his First Communion, he was hoping for some kind of spiritual connection with God. As he went through that First Communion, however, he felt nothing and became disillusioned. So he turned to art in order to find the spiritual connections he wanted to experience in the church. Palmsonntag, is a commentary on today’s gospel and on the practice of Palm Sunday. 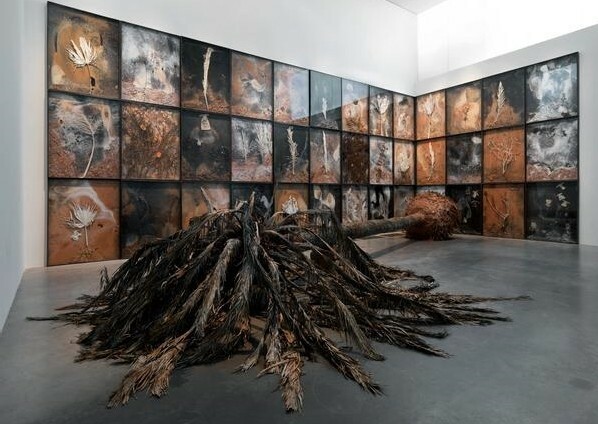 Kiefer constructs an incredible facsimile of an uprooted, life-sized palm tree lying dead on its side. Palms symbolize eternity, because palms always seem to regenerate themselves. Therefore, the palm is also an image of Jesus, the Son who came from eternity to die. For Kiefer, the dead palm is also a representation of our own desires to be in right relationship with God in a way that avoids failure. There is nothing we can do to make our way to God. There is nothing we can create in our own lives. There is no ritual we can employ. Rather, what Palm Sunday invites us to do is to think of all the ways we have tried to wrap in religious language our ambitions for ourselves, for our family, for our country, for our community, for our church. All of these things which we have been wrapped in religious language, all of them must die. Because at the end, we are left with nothing but God’s grace. And that, Kiefer seems to be saying in the sculpture, is the message of Palm Sunday. There is nothing but grace. There is only God’s grace working in our lives. And this should actually embolden us as we participate in all of our rituals of Holy Week. The point of these rituals is not to do them rightly, or perfectly, but to see in them a mirror of our imperfect selves, made whole by God’s grace and forgiveness. In what way can you risk a ritual this week? In what way is God in Christ making his way to you?